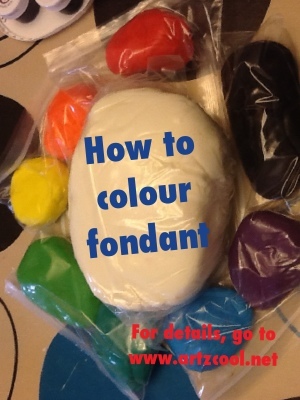 Adding colour to fondant | ARTZCOOL'S BLOG! We decided to have Samantha’s birthday party with her friends a little earlier this year because her birthday is in August, and it is always hard arranging a party in the middle of the summer when all of her friends are on holidays… Anyways, as usual, she has been very specific in her requests for the party. I’ll tell you about the details of what we are planning later, but the theme is based on build-a-bear… We are planning a build-an-animal party. I wanted to post about the details of the cake we are going to make. Once again, she has not held back in her instructions. She has requested a cake with a monkey, cat, dog, and bear on it. 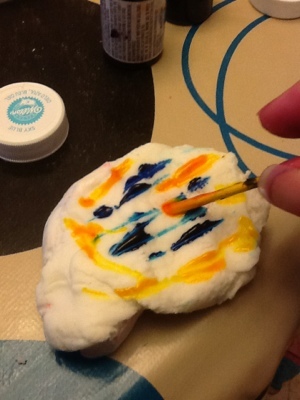 She wants two layers, the bottom layer with zebra pattern, and the top with clouds and trees. 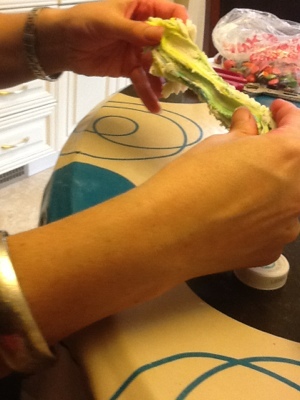 Nope, not finished yet… and, she wants a rainbow going from the top of the cake to the bottom…no problem! Right? 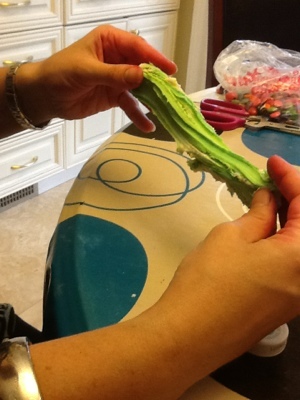 As you can see, we used the Wilton gel colouring. 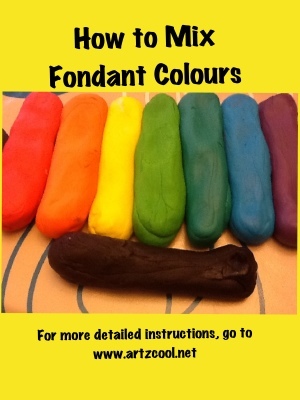 It is like food colouring but thicker, so it doesn’t make the fondant as sticky. It comes in lots of colours, even black, believe it or not! 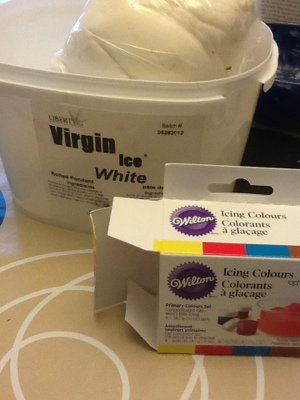 I use a BBQ skewer in each colour so the colours in each jar stay pure. I have to make every colour in the rainbow, but I followed the same basic method. 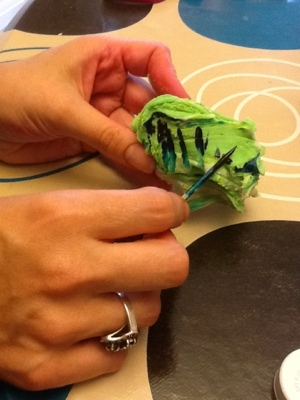 Use the skewer to put a little colour on the fondant. If you are mixing colours, always put more of the lighter colour… For example if you are making green, add more yellow and less blue. 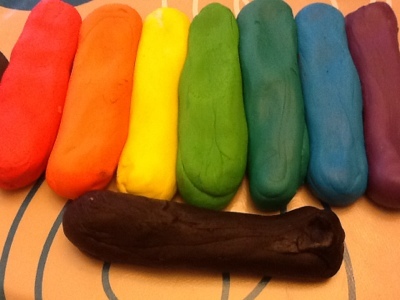 The darker colour will mix much darker and you can’t take away colour, but you can always add it. 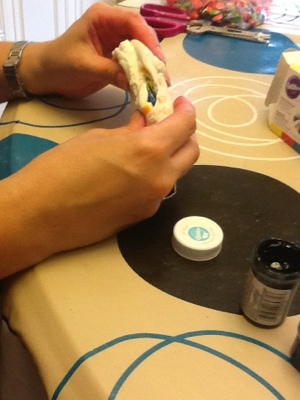 The pictures show us mixing the green…we obviously had to repeat adding colour a few times to get the right shade. The kids helped with the mixing too! 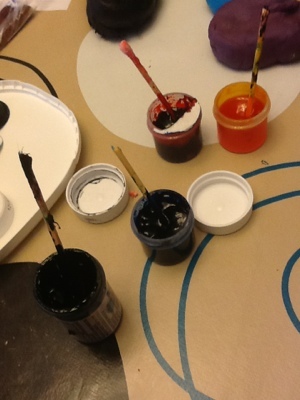 I repeated mixing using the primary colours to make every colour of the rainbow, plus black. 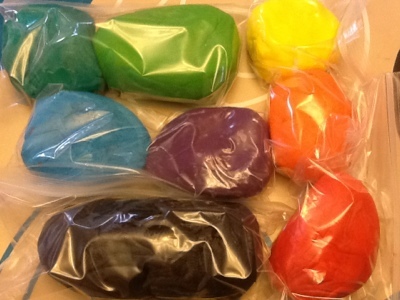 I put them in ziplock bags to keep them soft until we are ready to make the cake.